USS Ticonderoga (CV-14) on May 8, 1944, from the starboard bow at Norfolk wearing camouflage 33/10A. The vertical colors are navy blue, ocean gray and light gray. Photo source: NARA BS 86852. USS Ticonderoga (CV-14) earlier on April 22, 1944, from the port side docked at Norfolk wearing camouflage 33/10A. Photo source: NARA BS 86860. USS Ticonderoga (CV-14) on June 4, 1944, at sea outside of Norfolk wearing camouflage 33/10A. This photo is from squadron ZP-24. Photo source: NARA BuAer 234430. 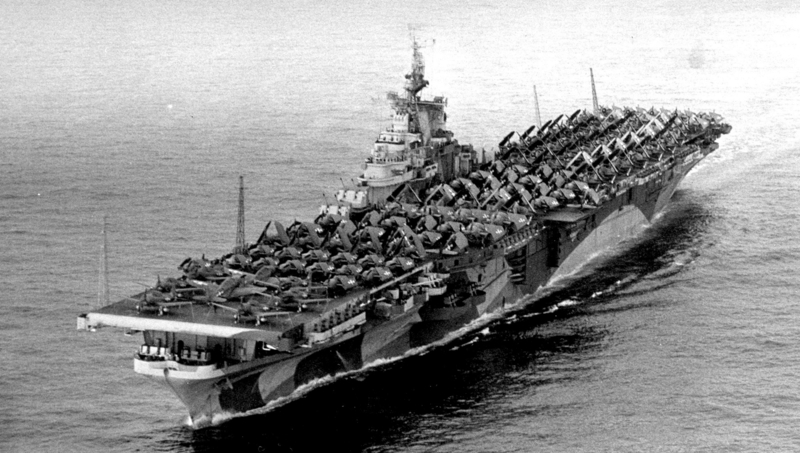 USS Ticonderoga (CV-14) on September 16, 1944, at sea wearing camouflage 33/10A and carrying a deckload of aircraft. The vertical colors are navy blue, ocean gray and light gray. This photo is from squadron ZP-31. 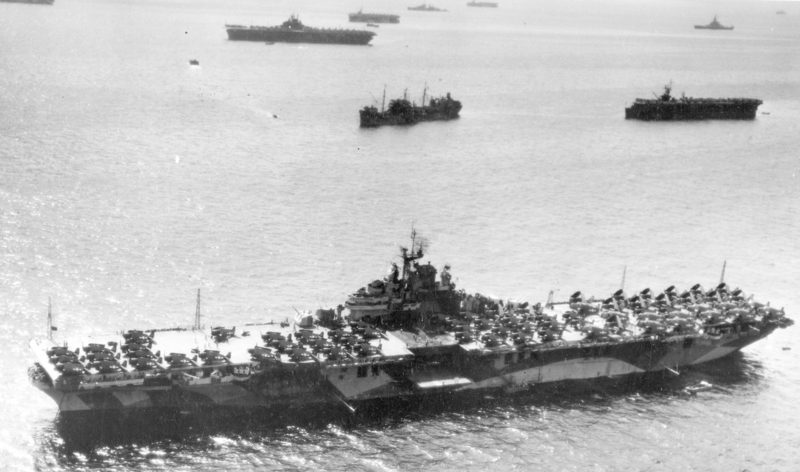 Another photo of USS Ticonderoga (CV-14) taken by ZP-31 on September 16, 1944, with a deckload of aircraft wearing camouflage 33/10A. USS Ticonderoga (CV-14) on December 8, 1944, at Ulithi still wearing camouflage 33/10A. Other unidentified ships of Task Force 38 are seen in background. Photo taken by one of Ticonderoga's own aircraft. Photo source: NARA 80-G-294138. 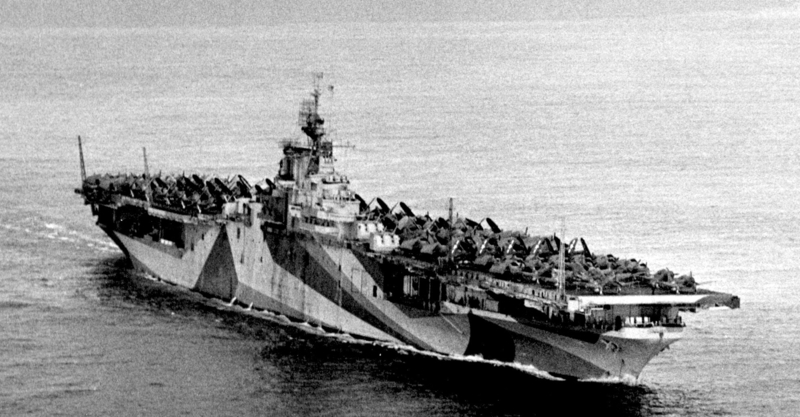 A starboard aerial view of USS Ticonderoga (CV-14) at Ulithi on December 8, 1944 in fading camouflage 33/10A. More ships of Task Force 38 are seen in background. Photo also taken by one of Ticonderoga's own aircraft. Photo source: NARA 80-G-294141.